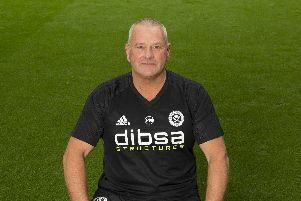 Ask Sheffield United’s first team squad about play-off hoodoos and you’re likely to receive either the Ancelotti Eyebrow or a vacant stare, writes James Shield. Past failures in end-of-season competition have little or no meaning for the majority of those at Nigel Clough’s disposal. And because, as Ryan Flynn explained, this latest campaign has a twist. “We’re all looking forward to the play-offs. That’s probably the biggest change this time around and it could make a huge difference. Flynn, as his words suggest, is a survivor of two previous attempts to gain promotion via the knockout route. First, in 2012, when unforeseen circumstances and Steve Simonsen’s missed penalty denied them an immediate return to the Championship before, a year later, they were beaten by eventual winners Yeovil Town. Although finishing 20 points off the top two pace represents, by the manager’s own admission, a disappointing return for a side which reached the last four of the Capital One Cup, Flynn told The Star it might yet work in United’s favour. Flynn’s colleague and compatriot Jason Holt features among the options to arrive at Bramall Lane since the turn of the year which means tonight’s semi-final first leg opponents Swindon Town will face a different test to the one they encountered in January. The former Scotland under-21 midfielder enters tonight’s match searching for his sixth goal in nine games after joining on loan from Heart of Midlothian. “Holty has been going on about how much he’s a champion and how he’s won the league already up there,” Flynn, who supports Edinburgh rivals Hibernian, continued. “He’s a top guy and he’s settled in really quickly. His performances have shown that. “Jason’s experience helps but, basically, he’s just a really good footballer and the way we play suits him. He’s a brave player and he likes getting on the ball, making runs. Because we don’t go back to front, it’s been a pretty seamless transition. “It reminds me of Scouggs (Stefan Scougall), when he came down (from Livingston), in many ways. He loved it too. Flynn is among a clutch of players hoping to face Swindon after recovering from injury. Having been deployed both on the wing and at full-back following Clough’s appointment, his versatility could prove crucial against the visitors from Wiltshire. “I just do whatever the manager wants. If he asks for different roles in a game, that’s game management. “I’m pretty easy going. I’ll slot in wherever the manager wants me to play. Barring a shock result, Monday’s return leg, not today’s contest, will decide who faces Chesterfield or Preston North End at Wembley Stadium in a little over two weeks time. The format means United will attempt to draw upon the experience they gained during skirmishes with the likes of Southampton, Queens Park Rangers and, of course, Spurs. “A few of us will be driven by what happened at Yeovil,” Flynn admitted. “You learn something from that.